• valvular heart disease (category 424). The term “heart disease” is often used interchangeably with the term “cardiovascular disease,” which refers to conditions that can narrow or block the blood vessels and may lead to myocardial infarction, chest pain, angina, or stroke. • Stable angina (413.9) is predictable, is brought on by exertion, and diminishes after resting and nitroglycerin is administered. • Unstable angina (411.1) is a change in the usual pattern of angina, such as being more frequent, more severe, lasting longer, or occurring at rest. • Chest pain (786.50) other than angina can have many other possible underlying causes. Chest pain that begins suddenly or lasts only a few seconds is less likely to be angina. • shortness of breath with exertion. • pain, numbness, weakness, or coldness in arms or legs. Chest pain is often the first indicator of CAD. The chest pain may be described as pressure, tightness, heaviness, squeezing, or burning. In addition, it may radiate to the left arm (most common), left shoulder, neck, lower jaw, midback, or right arm. Pressing on the chest wall does not cause the pain. Chest pain that is related to CAD may be termed angina pectoris. If, after careful study, a physician determines a patient’s underlying cause of chest pain to be angina and the patient has a documented history of CAD, then CAD will be sequenced as the principal diagnosis followed by the appropriate code for the angina (AHA Coding Clinic for ICD-9-CM, 2001, third quarter, page 15). CAD, the most prevalent type of heart disease, occurs when the coronary arteries become narrowed or blocked by plaque. Atherosclerosis is the most common cause of CAD and is characterized by a progressive buildup of plaque that causes less blood flow to the heart muscle, resulting in angina pectoris. If the blockage is complete, it leads to an acute myocardial infarction or sudden cardiac death. The ICD-9-CM diagnosis codes for CAD are classified to subcategory 414.0x. The fifth-digit subclassification identifies the location of the disease (eg, native vessel, bypass graft) and whether it has occurred in a transplanted heart. The appropriate code assignment will depend on the documentation, and it may be appropriate to assign more than one code from subcategory 414.0. If a patient has CAD and there is no past history of bypass surgery, then it is appropriate to assign code 414.01 to identify the CAD is in the native artery (AHA Coding Clinic for ICD-9-CM, 1997, third quarter, page 15). Code 996.03, Mechanical complication due to coronary artery bypass graft, should not be assigned for a diagnosis of coronary artery graft occlusion due to atherosclerosis. Assign a code from 414.0x instead (AHA Coding Clinic for ICD-9-CM, 1995, second quarter, page 17). Common symptoms of arrhythmias include tachycardia (fast heartbeat), bradycardia (slow heartbeat), palpitations or skipped beats, fluttering in the chest, chest pain or discomfort, shortness of breath, lightheadedness, dizziness, weakness or fatigue, syncope or near syncope, paleness, and sweating. A heart arrhythmia may not cause any symptoms and may be identified only during a regular routine exam. Common symptoms of congenital heart defects include cyanosis; swelling in the legs, abdomen, or area around the eyes; shortness of breath; easily tiring during exercise or activity; fluid in the heart or the lungs; and swelling in the hands, ankles, or feet. Common symptoms of cardiomyopathy include shortness of breath, swelling of the lower extremities, abdominal distention due to fluid, fatigue, irregular heart rhythm, dizziness, lightheadedness, and fainting. Common symptoms of heart infections include fever, shortness of breath, weakness or fatigue, swelling in the legs or the abdomen, arrhythmia, cough, and skin rashes. Common symptoms of valvular heart disease include fatigue, shortness of breath, irregular heartbeat or murmur, swollen feet or ankles, chest pain, and syncope. Tests to diagnose heart disease may include blood tests, chest x-ray, electrocardiogram, holter monitoring (ambulatory electrocardiography monitoring), heart biopsy, stress test, cardiac catheterization with coronary angiography, coronary MRI, cardiac CT, scan, and echocardiogram. Coding and sequencing for heart disease are dependent on the physician documentation in the medical record and application of the Official Coding Guidelines for inpatient care. Also, use specific AHA Coding Clinic for ICD-9-CM and American Medical Association CPT Assistant references to ensure complete and accurate coding. 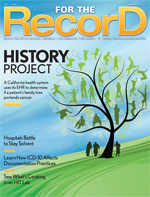 Editor’s Note: As we flipped the calendar to 2011, the deadline for ICD-10 implementation crept that much closer. To give coding departments a better idea of what the transition will be like, For The Record is expanding its popular Coding and Transcription column to include a sidebar that maps the ICD-9 codes to their more advanced counterparts. The idea is to give readers a stronger sense of what’s in store in the near future. Documentation specificity under the ICD-10-CM system for coronary artery disease (CAD) with and without angina is crucial for accurate classification of these disease processes. Combination codes including CAD with and without angina will exist under the new coding system. Unstable angina is classified to code I20.0. It includes accelerated angina, crescendo angina, de novo effort angina, intermediate coronary syndrome, preinfarction syndrome, and worsening effort angina. The combination codes for CAD with and without angina are in category I25 (chronic ischemic heart disease). I25.10, Arteriosclerotic heart disease (ASHD) of native coronary artery without angina pectoris; I25.11, ASHD of native coronary artery with angina pectoris, with further breakdown in I25.11 to specify the types of angina, including unstable angina pectoris, angina pectoris with documented spasm, other forms of angina pectoris, and unspecified angina pectoris. The I25.7 subcategory further breaks down CAD of coronary artery bypass graft (CABG) arteries and veins with angina pectoris. The I25.8 subcategory further breaks down CAD of CABG arteries and veins without angina pectoris. If a patient has both ASHD/CAD and angina, a causal relationship can be assumed, according to the ICD-10-CM Official Guidelines for Coding and Reporting. — Donna M. Smith, RHIA, is a senior consultant for 3M Health Information Systems.